As part of its ongoing community outreach, DWS continues to work with various organizations in promoting art awareness through educational workshops as well as raising money and providing art supplies to local elementary and high school art programs. “Come Paint With US” Public Library Workshops As part of its outreach activities, DWS continues to focus on exploring, creating, and sharing the wonders of watercolor with those who have an interest and desire to try this exciting and sometimes unpredictable medium. 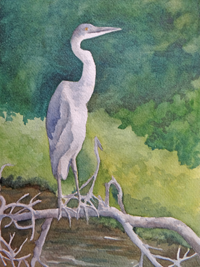 Since the fall of 2011, DWS members have presented free workshops for first-time individuals with little or no experience in painting to try the wonders of watercolor. 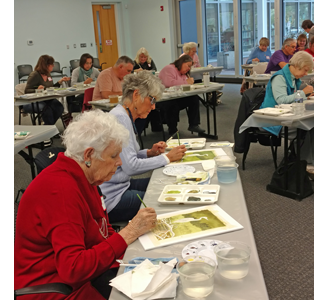 DWS develops from three to five sessions a year, and members provide step-by-step instructions on completing small watercolor paintings, greeting cards, and bookmarks depicting abstract, landscape, floral, still life, or animal scenes. Participants come away with an understanding of applied watercolor techniques, brushwork, and color usage. In 2016, we added South Coastal Library in Bethany to our program. The introductory painting sessions are very popular and usually have long waiting lists. These library partnership programs are made possible by the Friends of South Coastal Library and, in part, by grants from the Delaware Division of the Arts, a state agency dedicate to nurturing and supporting the arts in Delaware, in partnership with the National Endowment for the Arts. 2018 – Library Painting Sessions – 10:15 a.m. to 1:15 p.m.
For the last several years, DWS has supported winter clothing drives and year round donations to the Community Resource Center in Rehoboth Beach and their Baby Pantry. The center is run under the auspices of the Lewes-Rehoboth Association of Churches to help Sussex County residents in need. DWS members--under the leadership of Dianne Shearon, coordinator for the Food Rescue Program—have donated gently used coats, gloves, scarves, hats, and new socks for children and adults. Food items needed: Soups, beans, peanut butter, jelly, macaroni and cheese, pasta sauce, cans of fruit, ravioli and spaghetti, crackers and canned fish and meats. It was a summer of discovery for the children of New Beginnings at the West Rehoboth Community Center. On June 26th and July 24th of 2014, the Delaware Watercolor Society introduced boys and girls, ages 5 to 17, to the joys of watercolor. For these two mornings, each child was given all the tools needed to create their own masterpiece. The first morning’s project was creating “Illuminated Letters,” the second morning combined what they’d learned before adding a dolphin design to the mix. These first time watercolor artists rose to the challenge with great enthusiasm. DWS gave each child an Art Kit comprised of a watercolor set, brush, 2 pieces of watercolor paper, pencil, eraser, water container, and support board. The finished art pieces were displayed at New Beginnings for viewing and are now at home with the artists.